Influencers, also known as “creators”, are social media personalities that get paid to promote and advertise products. During this project I learned about influencer marketing and how the HYFN social media marketing team discovers and vets influencers. The original SoapBox supports monitoring metrics for influencer marketing campaigns however the most time consuming work is selecting the right influencers. My challenge was to best support the social media marketing team in their search process. How do marketing teams find and decide on influencers? What could be improved on in the search experience? Although the marketing team members were working with different clients, the same general strategy applied: a broad search resulting in a list of potentially hundreds of candidates, narrowed down by further examination of social media posts and group voting, then a final round of historical vetting. What I found was that the search process is extremely tedious, the team constantly searched for influencers by browsing individual social media apps and web searches. The most important factor is content, and finding a natural match between the influencers content and with the tone and lifestyle brands convey. The team maintained numerous spreadsheets of potential influencers for future clients. Helping the marketing team build and maintain lists of vetted influencers was the most obvious win. 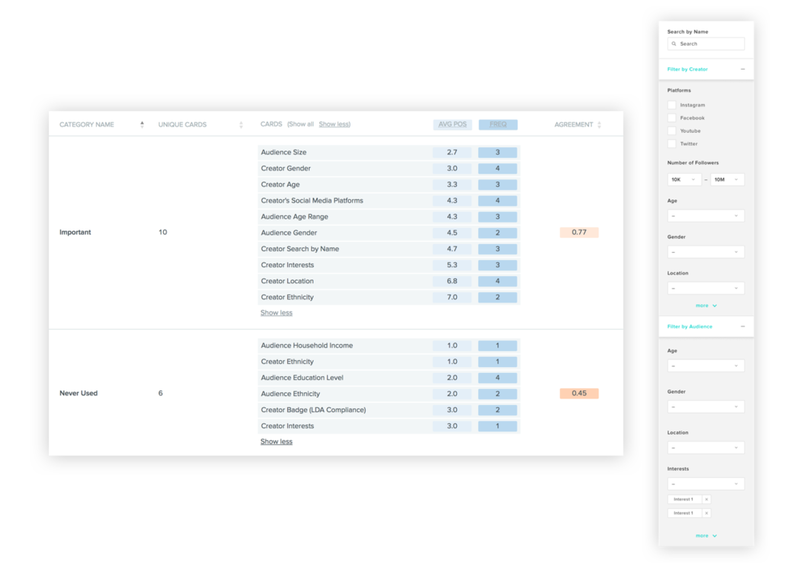 We leveraged an influencer search API Hypr to offer a built in search for influencers and metrics on the influencers performance and demographics within SoapBox. I tested out some clickable prototypes with the marketing team to hone in on a workflow that worked for the team. The early designs were medium fidelity, which felt like an appropriate level of fidelity. The side filter layout ended up being the most usable, and was desirable since the applied filters were always visible. During the usability test I found that the ability to save filter sets or default filters would be useful since the same filters often get applied. This feature was designed but slated for a later engineering release. Since most of the work is manually examining posts, it made sense to uncover which metrics if any could help lighten the tedious work. In our early conversations it seems that metrics were thought to be less useful for helping select appropriate candidate as they were culling out inappropriate ones. To help surface the most useful filters I conducted a card sort with the marketing team to understand which metrics were the most important. I conducted a card sort to understand which search filters would be the most used, and inform the display order of the filter items. On the main search page, marketers can quickly search for candidates and quickly add them to a list for more in-depth vetting later. Lists can then be duplicated, added to, and edited in the influencer list and list detail pages. The influencer detail page allows marketers to collate notes, and vote for the final influencers that will be engaged to participate in a campaign. In our initial design we decided to include all the available metrics from the Hypr API. The markers often looked at reach and engagement numbers but were often more interested in these numbers as a way to find up and coming influencers, rather than established influencers with multiple millions of followers. I had a lot of fun talking to and learning about the influencer marketing team and providing them with a tool that streamlines their workflow and helps them better share their searches across the team. The team was thrilled to have a better tool to use and were excited to start using the tool!